The family tree of Rock & Roll is a mind-boggling sonic seedling, if one tries to envision its ancestry and incorporating all of its genealogies, relations, and connections. One good, talented musician can be the source of endless lineages or branches, to much more spreading out over the years, as one artist begets another and another, and so on. The origin of our subjects today begins with Rod Alexander at the end of the Sixties, who is working as a session musician at Polydor Studios in London, England. He and a singer, Bill Kimber, are working as a songwriting and production duo when they begin entertaining the idea of forming a new band. Alexander recruits a pair of players he has worked with before, singer Earl Jordan and drummer Chico Greenwood, the latter of which recommends a bass player he has recorded with, Jon Taylor. Rod Alexander and his new band mates have not yet decided on a band name, but are actively songwriting and rehearsing. Guitarist Ritchie Blackmore (Deep Purple, Rainbow) and producer Derek Lawrence are working and recording the group Green Bullfrog (Deep Purple, Procol Harum, etc. members) sessions. Rod Alexander and Earl Jordan are also contributing to those recordings, during which talk of band names strikes up. Lawrence begins discussing how a homeless person, or someone of unknown identity, is labeled as a “John Doe” in the United States. He suggests the guys take that and shorten it to Jo Do… JODO… which they do and officially adopt as their own. After taking a shine to the band, Blackmore is present and hanging out at some of the JODO rehearsals, leading him to recommend them to the Decca/MCA label. 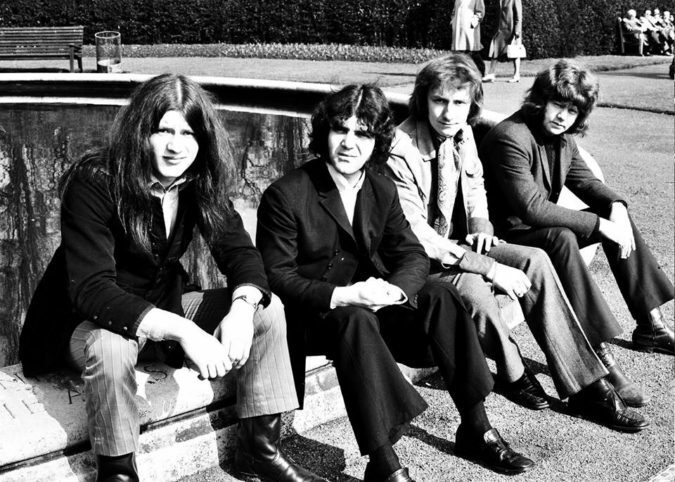 Derek Lawrence agrees to produce them and with all the pieces in place, JODO record their début album ‘Guts‘ with engineer Martin Birch (Black Sabbath, Deep Purple, Blue Öyster Cult), over the span of three sessions in 1971. The album is released in the U.S., New Zealand, and Germany that same year, but for some unknown reason that would be seen in hindsight as a mistake, ‘Guts‘ is not released in the U.K.
‘Guts‘ is a potent heavy blues and fuzz rock record by any standards, one brimming with electrifying songs and incredible playing. With three members providing vocals, they each add other dimensions to the music, which also translates well to the live setting. JODO plays a limited amount of shows around the U.K., but without a proper album release there, the band are treading water despite fans enjoying their live shows. Unfortunately, JODO never make it across the pond to the U.S. where ‘Guts‘ is making decent headway with rock fans. Within a few years of the album’s release, JODO has amicably parted ways, marking an end to the band in 1974. They never reform, reunite, or release a second album, but the one they left in their wake, ‘Guts‘, has become a cult revered effort. It was released on CD in 2007, making JODO a truly legitimate “one album wonder” in the years since the album’s release.